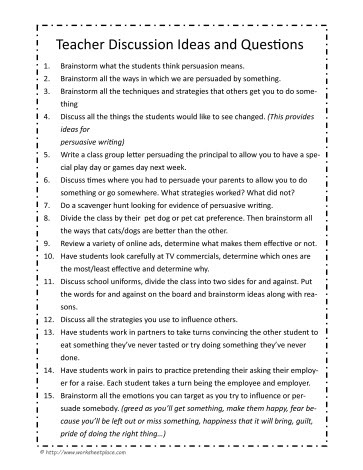 Brainstorm what the students think persuasion means. Brainstorm all the ways in which we are persuaded by something. Write a class group letter persuading the principal to allow you to have a special play day or games day next week. Discuss times where you had to persuade your parents to allow you to do something or go somewhere. What strategies worked? What did not? Do a scavenger hunt looking for evidence of persuasive writing. Divide the class by their pet dog or pet cat preference. Then brainstorm all the ways that cats/dogs are better than the other. Review a variety of online ads, determine what makes them effective or not. Have students look carefully at TV commercials, determine which ones are the most/least effective and determine why. Discuss school uniforms, divide the class into two sides for and against. Put the words for and against on the board and brainstorm ideas along with reasons. Discuss all the strategies you use to influence others. Have students work in partners to take turns convincing the other student to eat something they’ve never tasted or try doing something they’ve never done. Have students work in pairs to practice pretending their asking their employer for a raise. Each student takes a turn being the employee and employer. Brainstorm all the ways that may cause you to change your mind.